but in this image [we are] dwarfed by a man-made landscape. The artist’s decision to insert a body into a landscape scene reflects a conscious decision, and often carries a political message. How does the presence of the human body transform a landscape scene? What impact does the ruined body have on landscape and how the viewer interacts with it? Jacques Callot’s etching from 1633, La Pendaison (The Hanging), from his series “Les Misère et les Malheurs de la Guerre” (“Miseries and Misfortunes of War”), depicts a scene in which several bodies hang from a tree in the center. A crowd of people appears in the scene, and it can be assumed that they have witnessed this event. The artist created a particular viewpoint for the observer, which positions us alongside these bystanders. The etching makes use of a wide-angle perspective, encouraging the viewer not only to observe the bodies hanging from the tree, but also to consider the reactions of individuals in the crowd. Callot’s etching can be seen as an early example of documentary art. Prior to the seventeenth century, art more generally consisted of religious artworks, history paintings, and the emerging genre of landscape art. In the series Les Misère et les Malheurs de la Guerre, Callot chronicled the Thirty Years War (1618-1648) and presented imagery of the brutal realities of warfare: the violence of soldiers, peasants revolting, and the severe punishments that were meted out. This particular etching illustrates the hanging of soldiers as retribution for their crimes during war. The scene is deliberately unsettling – Callot intended for the viewer to feel uneasy. While realism functions as a major element in La Pendaison, Callot was subjective in his construction of these scenes, and as Diane Wolfthal has suggested, these scenes should not be viewed as candid photographs.3 Rather, La Pendaison emphasizes a reaction of “misère” in response to war, and demonstrates that Callot was concerned with the distinction between just/unjust causes and the conduct of war. Callot first condemned the abuses of the soldiers, and then supported their severe punishment following these crimes. Elsewhere in the portfolio, Callot’s etchings glorify those soldiers, whose conduct remained just. The prints in “Les Misère” are not an indictment against war, but a way to express concern over conduct during war. In contrast, Edward Burtynsky’s landscape photograph, Nickel Tailings #30, Sudbury, Ontario, offers a contemporary example of what is surely documentary art. Like Callot, Burtynsky intends for his viewers to feel uneasy when they grasp the content of the image. At first glance, the photograph is striking in its use of a vast landscape, high horizon line, and bold color. Nickel Tailings #30 is part of a series of photographs that document the effects of industrial waste, in the form of nickel tailings, on the natural environment. 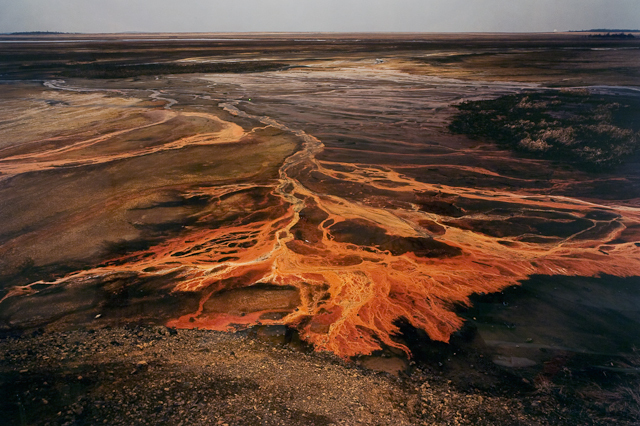 The photograph depicts a river that has turned bright orange from the presence of nickel waste in the water. The surrounding land is barren, which suggests that the pollution has made the environment inhospitable to vegetation. In an interview for Perspecta in 2008, Burtynsky emphasized that his photographic work is not a direct indictment of industrial activities.4 Rather, he suggested, his artwork is an effort to understand the scale at which humans have affected the natural world. For Burtynsky, his artwork reflects an inversion of the sublime. The sublime landscape once presented humanity dwarfed by nature. In Burtynsky’s photographs, we, along with nature, are dwarfed by a vast, constructed landscape. As in La Pendaison, the viewer is called to observe the present state of the landscape and to consider how this environment was created. What might be said of the body in these landscapes? Where is the body located? How is it represented? In La Pendaison, Callot inserts bodies into the physical landscape of a commons in Paris to comment on the contemporary political landscape of war and punishment. In Nickel Tailings #30, the body in the landscape may be represented by the river, a body of water polluted by the unseen activities of humankind. Like the hanging bodies of the soldiers in Callot’s etching, this body has been ruined. In both scenes, then, the artists have made the ruined bodies the central focus in the images. In Nickel Tailings #30, the artist’s absent body may also represent the body in the landscape. The artist’s body was required to both construct and frame the image, although Callot’s presence can be observed more directly in La Pendaison, due to the handcrafted process of creating an etching. The presence of the artist is obscured more easily in the mechanized process of the photographic medium; yet in both pictures the bodies of Callot and Burtynsky are noticeably absent. What does this say about the artists’ commitment to the inherent politics of their images? Does it challenge our own? 1 Edward Burtynsky, “Interview with Edward Burtynsky,” Perspecta 41 (2008): 153-173. 2 The inscription appears on the etching as: “A la fin ces Voleurs infames et perdus, / Comme fruits malheureux a cet arbre pendus. / Monstrent bien que le crime (horrible et noire engeance) / Est luy mesme instrument de honte et de vengeance, / Et que cest le Destin des hommes vicieux / Desprouuer tost ou tard la justice des Cieux.” Callot’s writing style and grammar reflect the transition in seventeenth-century France from Middle French to what we know as the Modern French language. 3 Diane Wolfthal, “Jacques Callot’s Miseries of War,” The Art Bulletin 59, no. 2 (1977): 225.